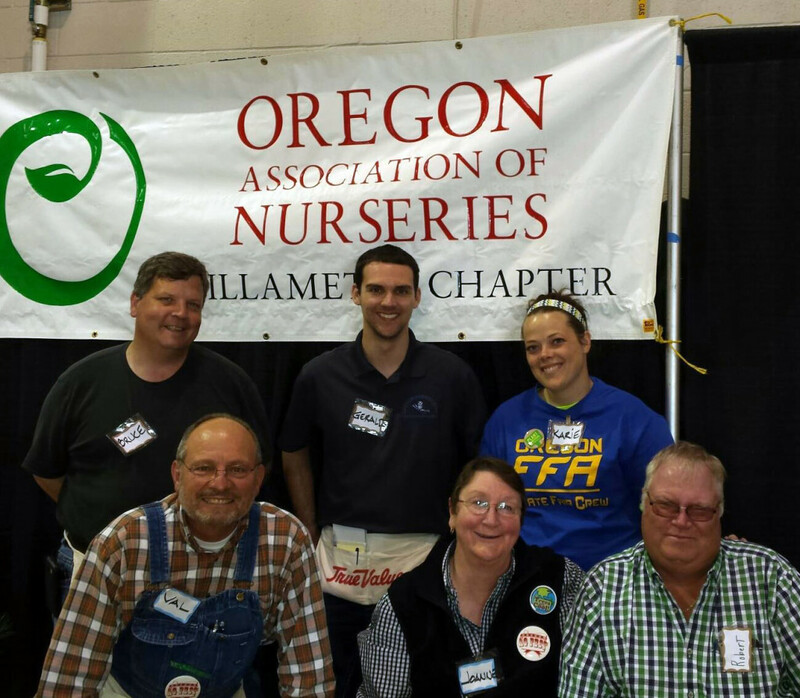 The OAN Willamette Chapter held its annual plant sale at the Oregon Ag Fest this past Saturday and Sunday, April 23–24, at the Oregon State Fairgrounds. The fundraiser tallied more than $4,700 in net profits, which will go directly to help further the education of local horticulture students. To date, the Willamette Chapter has donated more than $20,000 to Chemeketa Community College’s Horticulture Program. This year’s proceeds are earmarked for a new germination chamber to help with production of vegetable starts and other plant seedlings. In addition, the plant sale provides valuable customer service and sales experience for area high school students who belong to local chapters of the Future Farmers of America. FFA students from Gervais and McKay high schools got first-hand experience at writing up orders and assisting customers with their plant purchases. Unsold fruit trees were donated to the Marion-Polk Food Share’s Youth Farm. The six-acre farm gives young farmers an opportunity to learn organic gardening techniques while gaining work experience. Organizers thanked the plant donors who helped make this fundraiser possible: Alpha Nursery, Brooks Tree Farm, Brentano’s Tree Farm, Fleming Nursery, Holden Wholesale, Heritage Seedlings, KG Nursery, Kraemer’s Nursery, MalcolmLaw, Schiedler Nursery, St. Christopher Nursery, Sunflower Farms, Tree Frog Nursery, Van’s Nursery, Van Essen Nursery, Woodburn Nursery and Azaleas, and Youngblood Nursery. Organizers also thanked the two “drop sites,” Alpha Nursery and Brentano’s, where plants were staged for collection. Brenda Knobloch, garden coordinator for Salem Keizer Educational Foundation helped for a fifth year. In addition, the plant sale succeeded in large part due to repeat business from local families who have patronized the sale over the 15 years that the Willamette Chapter has participated in Ag Fest.